From a spicy Sriracha Big Mac to fried chicken breakfast sandwiches, McDonald's has tested numerous new foods and menu changes over the last several months in an effort to lure new customers. But there's at least one item on the fast-food giant's menu that it already perfected a long time ago: fountain Coca-Cola. McDonald's serves what's arguably some of the best Coca-Cola out there and, apparently, there's a reason for why it's so great. Turns out the top-notch quality of Coke at McDonald's is far from an accident. While you'd think that Coca-Cola and other fountain drinks are more or less sold the same way at every fast-food chain, McDonald's claims that its restaurants go above and beyond to ensure the drinks taste as good out of the fountain machine as they would out of a bottle. For example, McDonald's has its supply of Coke syrup delivered in stainless steel containers instead of the typical plastic packages used throughout the industry to help preserve its freshness, according to a report by The New York Times. The water and Coca-Cola syrup are pre-chilled before entering our fountain dispensers with the ratio of syrup set to allow for ice to melt. We also keep our fountain beverage system cold so your drink can always be at the peak of refreshing. In order to ensure our drinks are always meeting a gold standard, we have proper filtration methods in place. 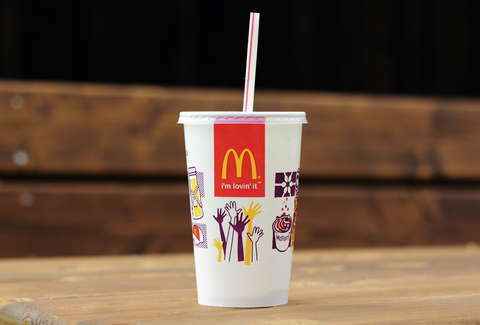 There’s also our straw -- it’s slightly wider than a typical straw, so all that Coke taste can hit all your tastebuds. McDonald's is not messing around. Of course, soda is far from the healthiest drink option, but if you're eating fast food anyway and feel like treating yourself, you might as well go all out, right? Relatedly, Mickey D's recently announced that any size drink will cost $1, starting in April. Just in case you were wondering what Mindy Kaling is talking about in that new ad. Tony Merevick is Cities News Editor at Thrillist and generally avoids soda, but can remember how good McDonald's Coke tastes. Send news tips to news@thrillist.com and follow him on Twitter @tonymerevick.